i love sewing with vintage sheets, and i’ve had great luck finding lovely, nostalgic patterns at a normal thrift store. you get a lot of yardage for little money – most of mine are full size sheets that cost about $4 or $5 each! a full sheet is 81 x 96″ (2 1/4 yds x 2 2/3 yds), so it really is a great amount of fabric and you can often get multiple projects out of the same sheet. want to know more? i found almost all of mine at goodwill. there are usually a few lovely vintage sheets buried among the ’80s grids and scratchy cheap modern ones when i go (and i actually don’t get out thrifting very often). if i find a print i like, i buy it because i never know if i’ll see it again. if you can’t find any where you live, a quick search for “vintage sheets” in the vintage category of etsy yields 250 pages of results! i tend to gravitate toward florals. hey, how’d that get in there? a stripey outlier! clothes! i’ve been sewing almost 3 years now and am only recently starting to have any success at sewing clothes for myself. i’m so nervous trying something new, i tend to prefer using inexpensive fabric so i don’t stress out if it’s a flop. for my bow collar top, i was drafting adult-sized sleeves for the first time and adding a bow, and i was pretty terrified it wouldn’t work out at all. i used a vintage sheet just in case, and it actually turned into a nice top! 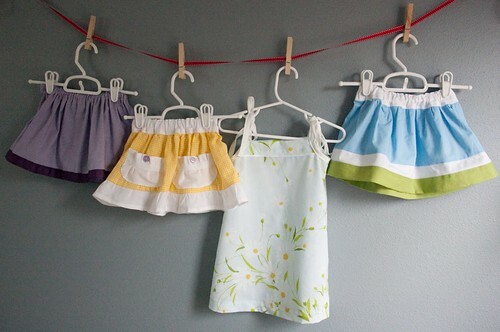 they’re good for kid’s clothes because they resist wrinkling and are very soft. many i’ve found seem to have some polyester in them, but are mostly cotton (details of the skirts below here and here). i really like using vintage sheets for quilts and picnic blankets. plenty of yardage means you can easily make a baby-sized whole cloth quilt (the funnest and quickest quilts to make, if you ask me. that’s right…funnest) with plenty to spare. check to make sure they’re not too threadbare first. 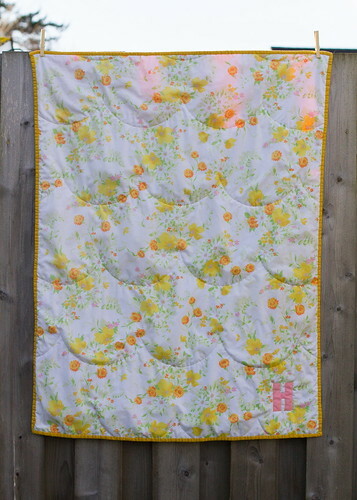 this quilt is backed with new quilting cotton. 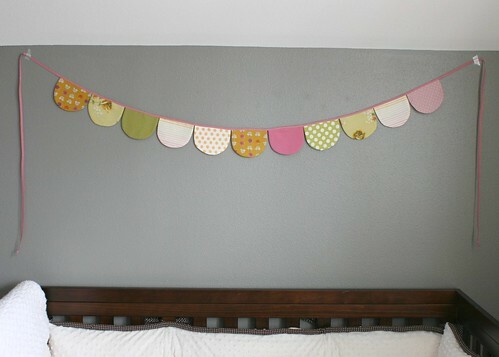 or you can mix them with new fabrics to make a sweet garland. two vintage sheets are featured in this one. can you spot them from my stash above? 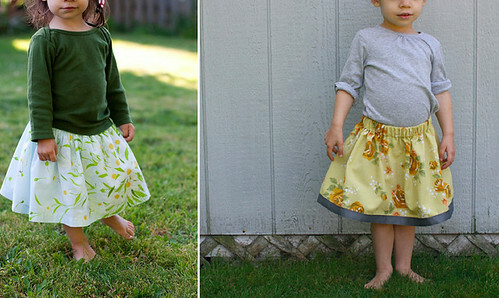 here, the popover sundress is a vintage sheet, and again, it blends nicely with skirts made with newer fabric (details here). be sure to wash them once (or twice) first and avoid holes and stains when placing your pattern pieces. 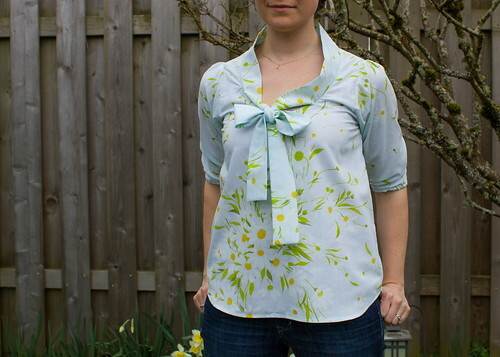 try a floral with a modern pattern, use them to build your sewing confidence, and wear your vintage sheet with pride! for even MORE vintage sheet inspiration, visit the vintage sheet blog! 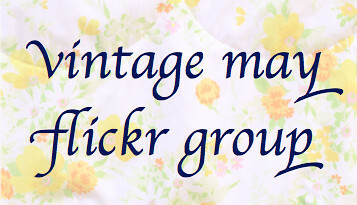 have you sewn anything from vintage sheets, especially garments? please add them to the vintage may flickr group! today my co-host jess has sewn a sweet little dress with a vintage pattern and modern fabric. you can find it here. more about vintage may here. That quilt is my absolute favorite. You do so well at sheet thrifting, I’m yet to find any pretty florals. And I feel exactly the same about adult sewing, the thought of using really nice / expensive fabric terrifies me. Great collection of stuffs! I love Vintage May! Keep it comin’, Kristin! Hmm . . . 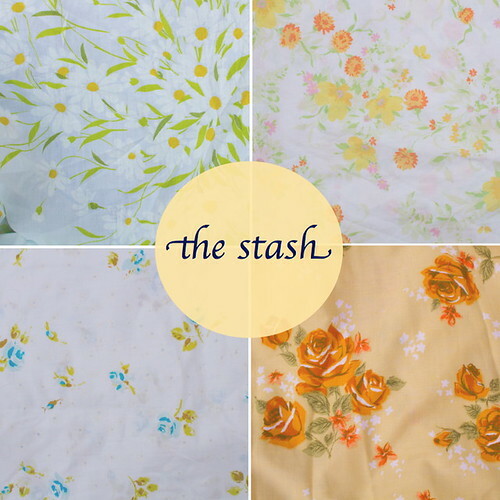 I actually have a huge vintage floral print sheet just sitting in my stash . . . what to make!? That quilt is pretty awesome. 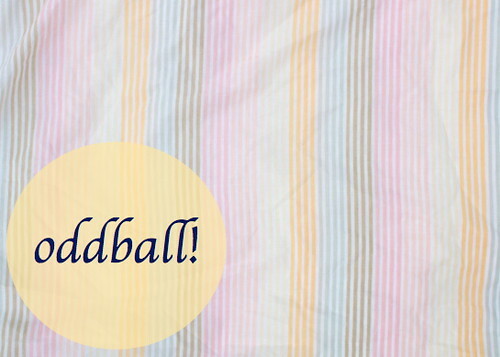 And I LOVE that stripey oddball sheet!! I want a shirt in that. great sheet projects! you’ve found some really pretty ones. i just scored one from my sister and i’m trying to figure out what to do with it…thanks for the ideas! I just bought a bunch of vintage sheets and pillowcases at a yard sale in honor of “Vintage May”! I was so excited to find them! I haven’t made anything with them yet but I posted some pictures of my new stash. oh that’s so cool! glad you’re playing along, tara! yay! Thanks so much for the shout out. I actually just bought the daisy sheet you featured in a couple pictures this past weekend. My mum saw it hanging on my line outside and laughed that she had the same sheets when I was little. Wow Kristin, you’ve only been sewing for 3 years? I am even more inspired by you! Hoping to jump into the may flickr pool soon!